The Dalai Lama has given his blessing to a new course of evening classes, available across the UK, promising to make participants happier… and the world a better place. The eight-week course, designed by the Action for Happiness organisation, claims to be scientifically proven to increase life satisfaction, mental wellbeing, compassion and social trust. Entitled Exploring What Matters, the classes will be free - although organisers do ask for a donation to cover costs. Hundreds of people have already volunteered to host the course in locations across the UK. 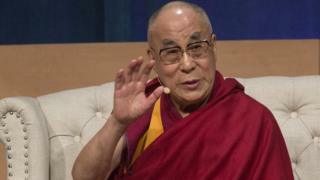 Launching the course on World Peace Day, the Dalai Lama said he was delighted to see the "work being done to create a happier and more caring society". "I wholeheartedly support the Exploring What Matters course and hope that many thousands of people will benefit from it and be inspired to take their own action to help create a happier world," he said. During the course, local groups explore a series of questions including "What really matters in life? ", "What really makes us happy?" and "How can we create a happier world?" The approach is similar to the successful Christian Alpha course, started in London in the 1970s and now run in more than 150 countries around the world. Alpha describes itself as an opportunity to explore the meaning of life. Action for Happiness stresses that Exploring What Matters is a secular project based on science rather than faith. Over the past few decades, the study of human wellbeing and happiness has become an established scientific discipline. In the UK, the Office for National Statistics is developing measures of wellbeing so government policies can, in its words, "be tailored to the things that matter". New ONS wellbeing data is due to be published on Wednesday. The organisers of the new happiness course claim that analysis of pilot courses has proved it leaves people happier and more likely to help others. Some participants say the classes have been life-changing. "I wouldn't be where I am now without the course," says Jasmine Hodge-Lake, who took part in one of the pilot classes having suffered for over decade from chronic pain which left her unable to work. "I found there were things I could do that would make a big difference and started to feel hopeful about the future," she says. "I still have bad days and life certainly isn't perfect, but it has really helped me so much." A class begins with a session of mindfulness, an ancient Buddhist practice during which participants deliberately focus their attention on the present moment, becoming aware of sensations and thoughts. It is an approach now used by the NHS and some schools to improve mental wellbeing. "Starting each session by tuning in with short mindfulness and gratitude exercises creates a calm and positive atmosphere and encourages friendly connections," says Mark Williamson, Director of Action for Happiness. "In the modern world we are bombarded with false messages about what makes for a happy life," he says. "Real success has much less to do with what we earn or consume - and much more to do with our inner attitudes, our relationships with others and our contribution to society." Each class includes information on the science that underpins the topic, including video talks from some of the world's top experts on happiness and wellbeing. "A good society is one where as many people as possible are able to live happy, fulfilling lives," says Lord Layard, co-founder of Action for Happiness and author of Happiness: Lessons from a New Science. "We want to see this course happening in thousands of local communities to help like-minded people support each other in taking practical actions which are not only good for their own wellbeing but also contribute to the happiness of others around them too." Action for Happiness says it hopes to see courses run in thousands of local communities. As the old song goes, the aim is to "spread a little happiness as you go by".